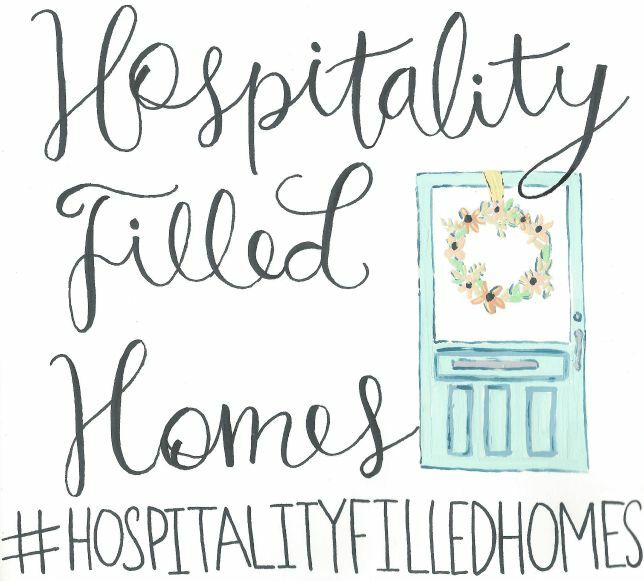 Today I'm so excited to be part of a special series created by Sonya of At Home with the Barkers and Melissa of Daisy Mae Belle, called Hospitality Filled Homes. 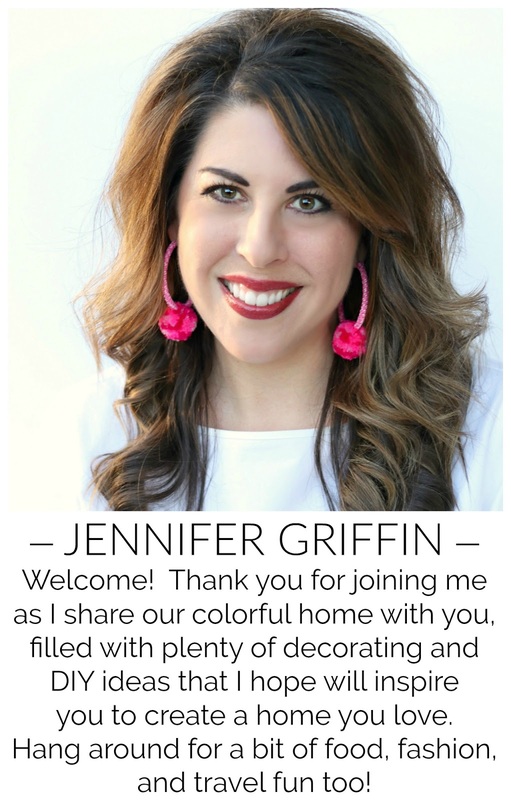 We want to encourage you to share your home with others, and are giving you some simple decorating ideas as you do just that. 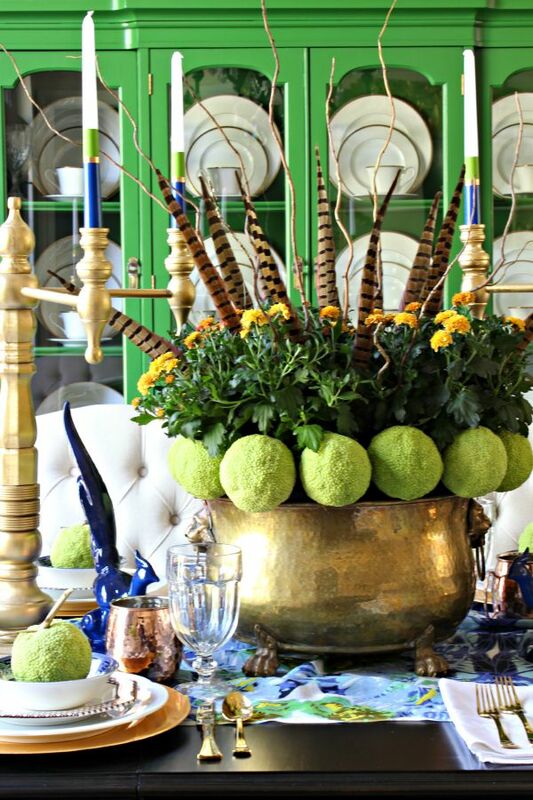 The theme today is Fall Centerpieces. The colors I used aren't quite conventional for Fall, but that's never stopped me before! I knew I wanted to use horse apples and mums, so I expanded my color palette from there. I'm a big fan of using a creatively folded strip of fabric for a table runner, but this time I found something even easier... a scarf! 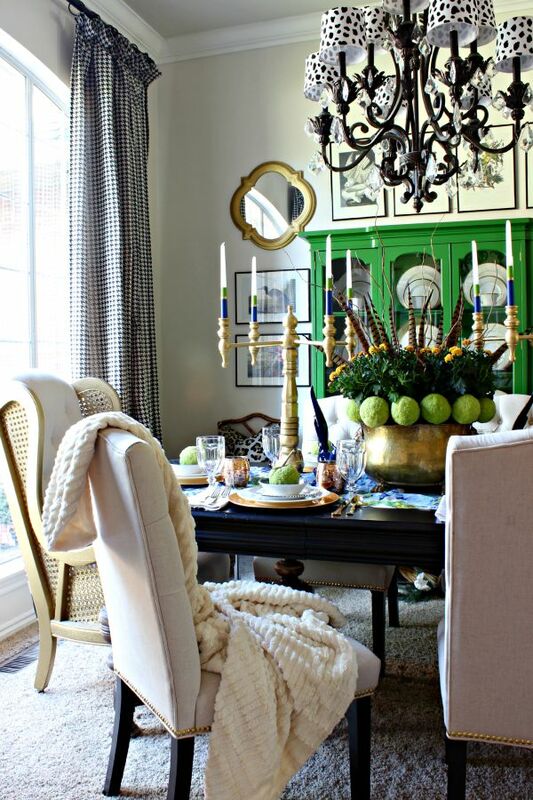 This one that had the bright green of the apples and some browns and yellows to tie in some Fall colors too. 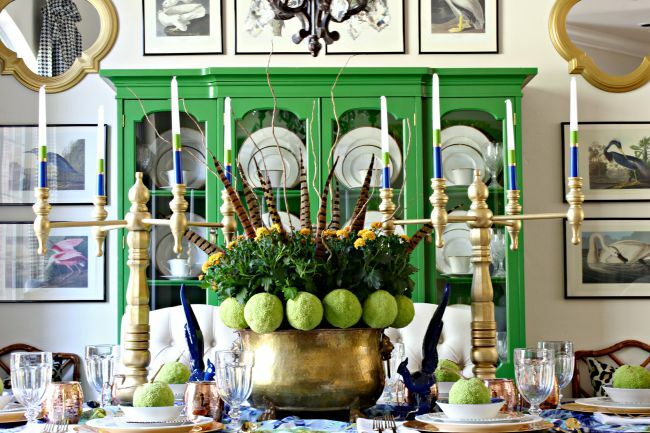 And, the blue was a bonus since I never miss a chance to use my Blue Willow on the table! 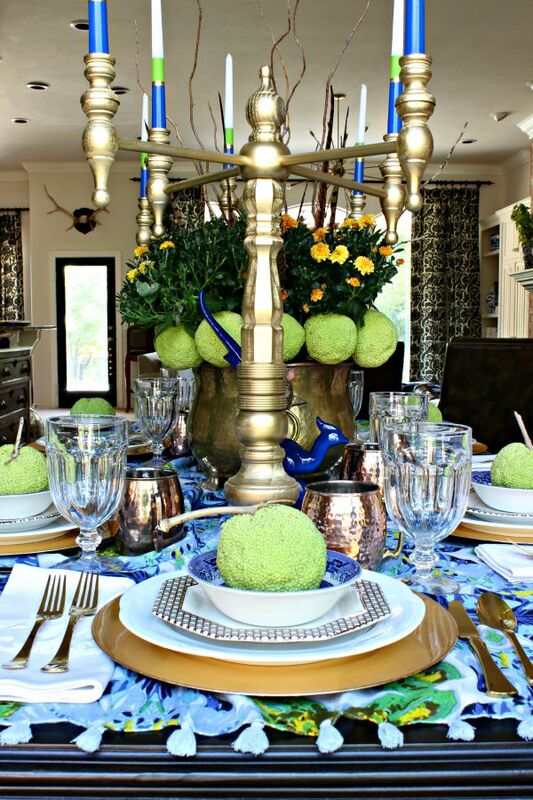 This simple centerpiece was easy to assemble in just a few steps. First, choose a container. 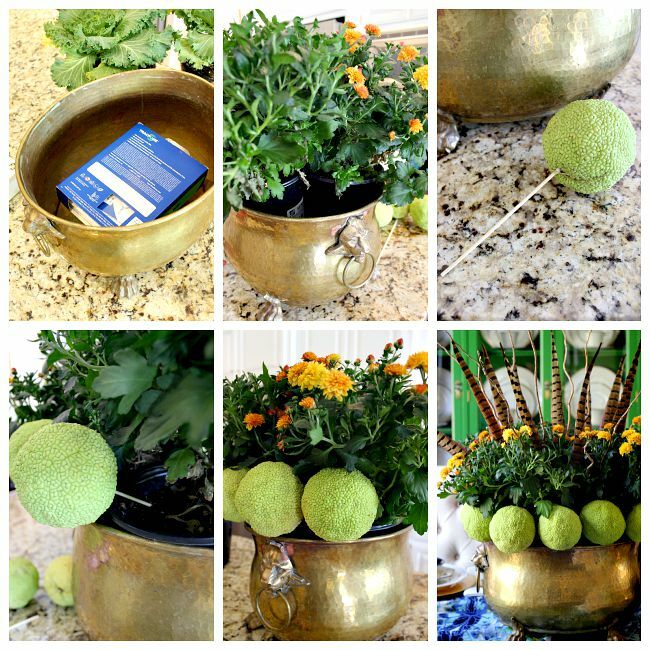 I used a brass planter, but a basket or flowerpot would work just as well. I filled the bottom with a few boxes to boost the height. Then, I filled the planter with a few mums, plastic pot and all. 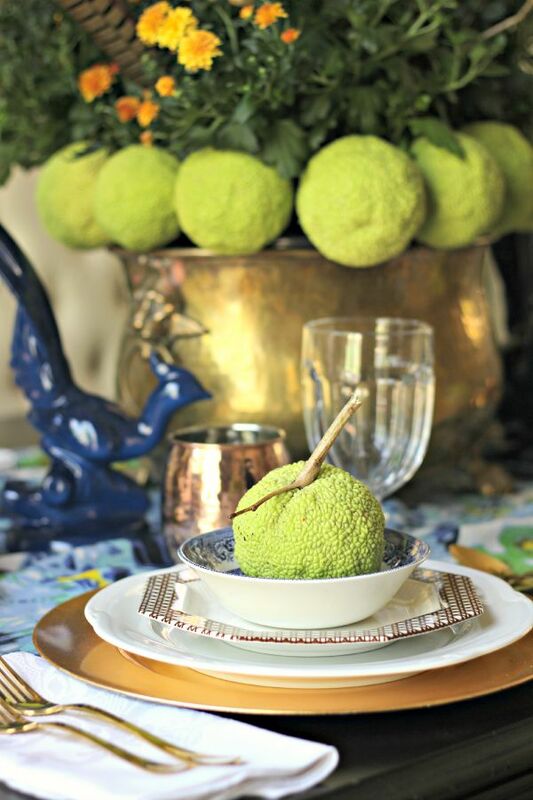 Insert a wooden skewer into each horse apple (near the spot where the stem was attached so that will be in the back), and trim skewer a few inches if necessary. Next, position the skewers into the mum flowerpots, securing the horse apple right along the edge of the container, and continue all the way around. I added some pheasant feathers and curly branches to the top for added interest. It's pretty easy in my area this time of year to find horse apples somewhere on the side of the road, but if there aren't any where you live, green or red apples, pears, limes, oranges, or anything similar could be substituted for a similar look. 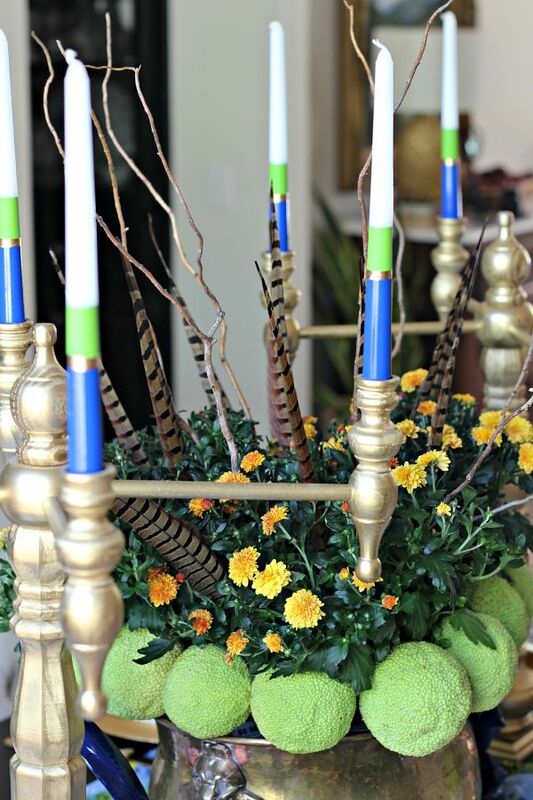 For me, part of the appeal of this centerpiece is that when the gathering is over, the mums can be added to my Fall landscape outside. 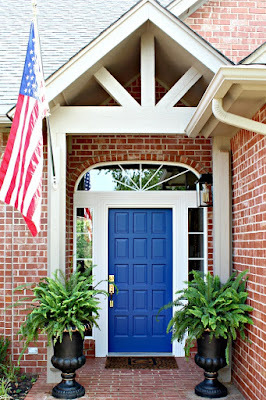 In fact, these will probably be on my porch next week for the second part of my Fall Home Tour (see my Early Fall Tour here)! I finished the table off with a pair of DIY candelabras that this smart gal showed us how to make, filled with candles that I painted stripes on to tie in with the color palette of the table. 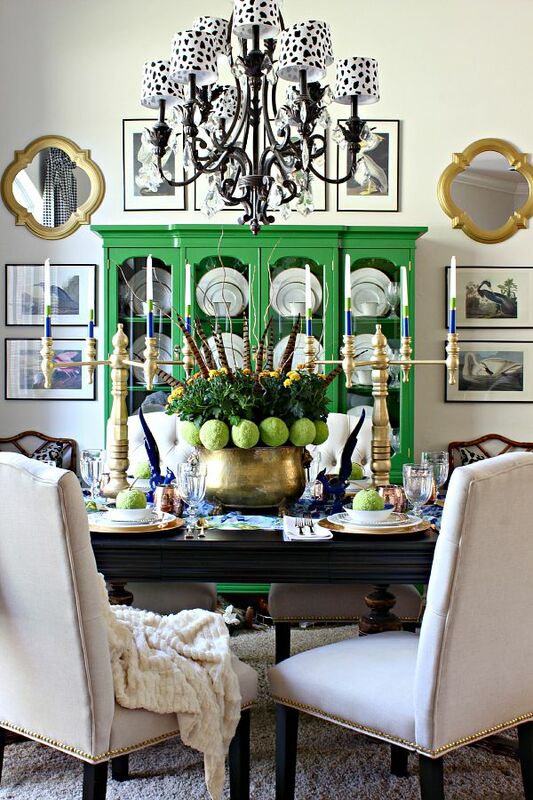 I would remove the floral centerpiece from the table when guests are seated, but the candelabras are tall enough to not visually block anyone during conversation. 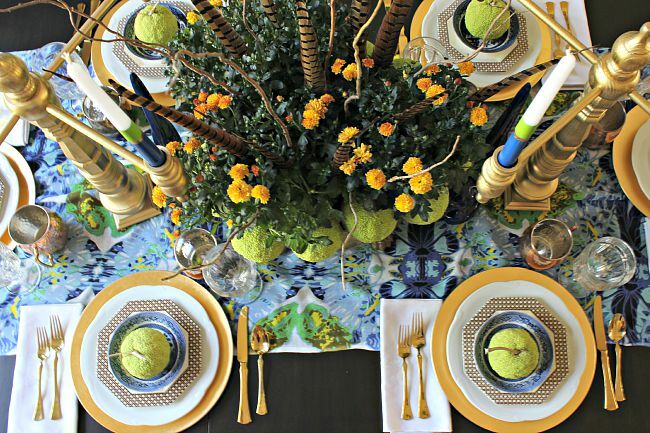 Be sure to check out these other participants and their Fall Centerpieces today for more great entertaining ideas. 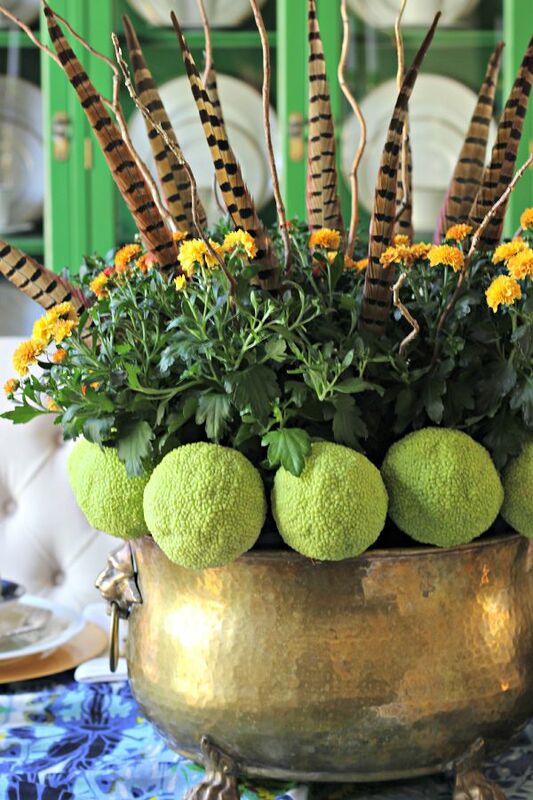 We'd love to see your Fall centerpieces today, too. 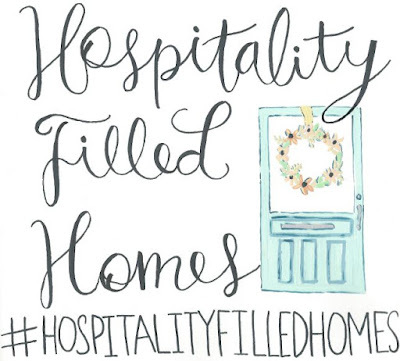 Just tag a photo with #HospitalityFilledHomes on Instagram and join in the fun!